Most water heaters last 10 to 15 years. Wet spots on the floor or rust on your tank may signal that you have a problem. 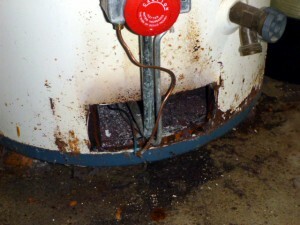 Lots of rust flakes in the combustion chamber will also indicate the water heater is near the end of its useful life. Other signs that the hot water heater is at the end of life is when the water smells like rotten eggs or, when the heater is heating, sounds like there are marbles rolling around inside the tank. When any of these signs are noted, the tank is usually between 10 and 15 years old and ready for replacement. It is best to replace a heater before it leaks and avoid any water damage. When installing a new heater install a catch pan under the heater, if possible, with a drain line to the exterior of the house or a floor drain. If a leak develops and you have a catch pan and drain, the water will be diverted and discharged of properly. Metal or plastic drain pans are inexpensive and well worth the protection they provide in the event of a leak.